With four adjustable shelves and one fixed raised bottom shelf, these storage cabinets have a space for just about everything. 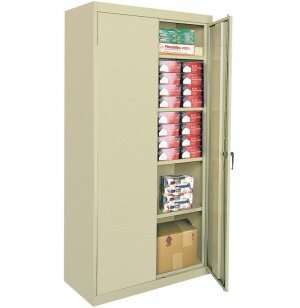 Whether you are storing binders, art supplies, cleaning equipment or anything else, these cabinets are an excellent choice. 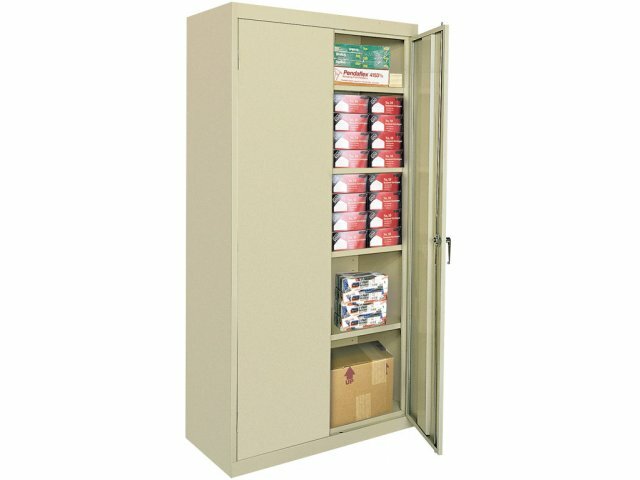 Stationary Steel Storage Cabinets come in a variety of sizes and styles that will accommodate any classroom or office storage needs. Choose from a selection of wardrobe, janitorial and classic cabinet designs, all durably constructed for long-lasting use. Steel welded construction keeps these cabinets standing strong. Locking doors secure contents so there is no need to worry when you leave the room or lock up at the end of the day. These cabinets feature adjustable shelves that can hold up to 150 pounds each. Their user-friendly features are complemented by a selection of professional colors to coordinate with any space or taste. Secure: Doors are connected with three sets of hinges. Strong: Each shelf has a capacity of up to 150 lbs. Adjustable: Shelves adjustable in 2" increments. Safe: Two chrome handles with lock and two keys. Durable: All welded steel construction with concealed hinges.